European technology satellite. 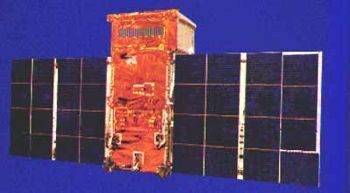 Sixth satellite of ESRO. Astronomy, X-Ray satellite built by Engins Matra (prime), ERNO (structure), Saab (communications) for ESRO, Europe. Launched 1972. Status: Operational 1972. First Launch: 1972-03-12. Last Launch: 1972-03-12. Number: 1 . Gross mass: 472 kg (1,040 lb). Family: Sun synchronous orbit, Technology, Technology satellite. Country: Europe. Spacecraft: ESRO. Launch Vehicles: Thor, Delta, Thor Delta N. Launch Sites: Vandenberg, Vandenberg SLC2E. Bibliography: 2, 279, 6, 6967, 13263. 1972 March 12 - . 01:55 GMT - . Launch Site: Vandenberg. Launch Complex: Vandenberg SLC2E. LV Family: Thor. Launch Vehicle: Thor Delta N.
TD-1A; Thor Delta 1A - . Payload: TD 1A. Mass: 472 kg (1,040 lb). Nation: Europe. Agency: ESRO. Class: Technology. Type: Navigation technology satellite. Spacecraft: TD-1A. Decay Date: 1980-01-09 . USAF Sat Cat: 5879 . COSPAR: 1972-014A. Apogee: 550 km (340 mi). Perigee: 523 km (324 mi). Inclination: 97.60 deg. Period: 95.40 min. Sixth satellite of ESRO. Also registered as US object 1972-14A in A/AC.105/INF.255 with orbit 95.3 min, 525 x 548 km x 97.5 deg, category B. .